Le Corbusier, while planning the City Beautiful, very consciously, retained the water bodies flowing through the natural terrain. Records show that "despite, his love of the machine aesthetic, Le Corbusier was determined that his architecture would reintroduce nature into people's lives." He thought that "Victorian cities were chaotic and dark prisons for many of their inhabitants". Right to education is here, but is UT up to the task? An anti-encroachment drive was carried out today in Pocket No. 8, Mani Majra, Chandigarh, to remove unauthorised constructions raised on about 49 acre of the acquired land. Litigants were left in the lurch and had to settle with fresh dates for their cases after the district courts Bar Association went on a token strike here today. The association was protesting against the alleged inaction by the Punjab Police against the accused responsible for the death of an advocate in a road accident on January 26. 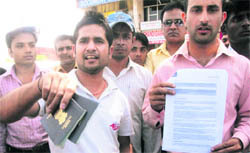 Tempers ran high outside the office of a Sector 42-based immigration consultant here this afternoon when people accused him of defrauding them of thousands of rupees on the pretext of sending them abroad. 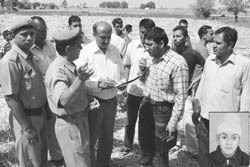 Taking a step further to save Sukhna Lake from silting, the Chandigarh administration has asked the Society for Promotion and Conservation of Environment (SPACE), a local NGO, to study the silting of water bodies constructed in the area since 1975. Piqued over the arbitrary increase in the collector rate announced by the district administration, property dealers here said the higher rate would affect their business badly but also cause a loss to the exchequer. Giving hearing to all 45 complaints filed in public hearing session today, Punjab Governor and UT Administrator Shivraj V Patil disposed off most of the complaints on the spot and remaining have been marked to the departments concerned for comments. 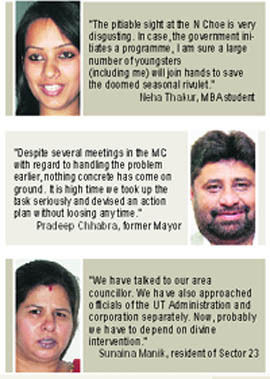 Tall claims of the state government to turn Mohali into another Singapore fell flat, as the residents here are still struggling for regular water supply. A week after the financial commissioner (revenue), Punjab, issued a notification enabling the re-allottees to get the conveyance deed of their properties registered at allotment rates, a number of re-allottees are still waiting for the orders to be implemented. The residents of the city heaved a sigh of relief as the 10-day deadlock between the powermen and the residents of Saketri village over the hostage drama ended as both the parties reached a compromise and agreed to withdraw cases filed against each other here today. Residents of Pabhat village today protested at the office of the Public Health Department against the inadequate water in the area. The Punjab and Haryana High Court today summoned the entire record of selection of Dr Raj Bahadur as the Director-Principal of Government Medical College and Hospital (GMCH) - 32. The municipal corporation’s objective of providing uninterrupted water supply to city residents has received a setback with the Punjab government’s refusal to allow expansion of the Kajauli phase V and VI scheme. 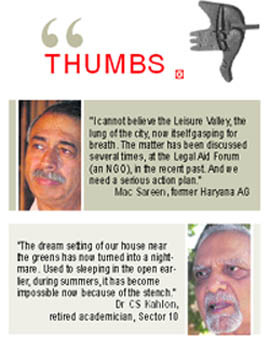 Blame it on fear psychosis among landlords, about 20,000 houses, mostly belonging to NRIs, are lying vacant in Chandigarh. This is despite the fact that thousands of persons are in search of decent and affordable rental accommodation in the city. The city residents enjoyed the choicest verses presented by eminent poets at a kavi sammelan organised by the Haryana Sahitya Akademy in association with the department of information and cultural affairs, Haryana, at the Randhawa Auditorium here today. Under mysterious circumstances two scooters caught fire in the parking of Girls Hostel No. 2 at the Panjab University this morning. In a drama that lasted for half an hour in the parking lot of the department of laws, Panjab University, today, a swarm of honeybees attacked some students who were standing beneath a tree which had a bee hive. Although honeybees attacked three students, they managed to escape and no major injury was reported. Even as Panjab University has introduced about 20 new departments and centres, ironically several prior existing departments, especially those teaching different languages, hardly have any students. Following a protest by nearly 110 students of Panjab University here today, the authorities have agreed to modify the dates of re-appear examinations of the University Institute of Legal studies. A high drama prevailed outside the National Institute of Open Schools, Sector 11, here today when the parents and the applicants protested for not getting their roll numbers till date though the exam starts from tomorrow. The trial in the Boston molestation case involving Panjab University student, Nitin Jindal, is scheduled to begin tomorrow in Boston. 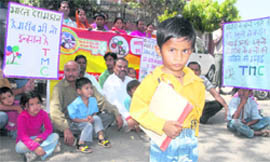 Government teachers are protesting against the move of the district administration in deputing them on Census duty. Around 1,000 teachers are being deputed on the census in the district. The forthcoming National Census has put city private schools in distress with the UT Administration asking them to spare up to 50 per cent of their teaching staff for the month-long Census work beginning April 15. A woman was killed and a man was seriously injured in a road accident at the Landran road in Kharar at around 9.30 pm. The followers of Dera Sacha Sauda distributed ration consisting daily need items to the 12 needy families of the area here yesterday. The Punjab Students’ Union held a meeting here today. The body of a 15-year-old boy was found under mysterious circumstances in fields at a nearby village today. The deceased was identified as Amandeep Singh, a resident of Machhaunda, near here. Army personnel on casual or annual leave shall be considered on duty in case of any mishap, a three-Judge Bench of the Punjab and Haryana High Court today ruled. The HC has called for proposals from civic bodies across Punjab, Haryana and Chandigarh to furnish proposal on vehicle parking. Justice Rajive Bhalla has also asked the authorities concerned to demarcate the parking areas in front of the shopping malls in Gurgaon. The directions by Justice Rajive Bhalla of the Punjab and Haryana High Court came on a contempt of court petition filed by city-based advocate Ajay Singh. 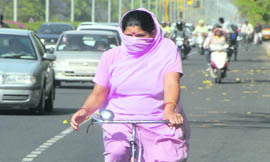 The instructions are aimed at ensuring free flow of traffic in Chandigarh, Amritsar and Gurgaon. The writ petitions challenging the constitutional validity of Haryana’s decision on setting-up Panchkula Municipal Corporation, comprising Kalka, Pinjore and Panchkula, were today admitted for regular hearing. The State Consumer Disputes Redressal Commission has directed a Ludhiana-based firm to pay Rs 5,000 as compensation to city-based MK Malhotra instead of Rs 2,000. Rachit Nagpal, who was arrested by the police last evening, was produced in the local court, which remanded him to five days in police custody here today. Prema, a resident of Mohali, who had attempted to escape from the clutches of law by jumping from the second floor of a building after he was nearly caught stealing sanitary items from an under-construction building at Swastik Vihar, Zirakpur, succumbed to his injuries at the GMCH-32 today. A swindler decamped with a bag containing Rs 1 lakh from a shop in Sector 22 here this morning after diverting shopkeeper’s attention by demanding a cold drink. The moment the shopkeeper turned to pick the cold drink bottle from a refrigerator, the miscreant fled with the bag. A scooterist was killed in a hit-and-run mishap, while a pedestrian was injured in two separate road accidents in the city. Three unidentified motorcyclists allegedly chased and fired a shot at a 24-year-old youth, injuring his shoulder, near his residence in the PGI here late last night. The victim’s family told the police that a Ludhiana resident, who had filed a kidnapping case against their son, was behind the incident. With the arrest of three residents of Ram Darbar, the police today claimed to have solved seven cases of burglary in the city. Abhijit Chadha stole the thunder by firing a sizzling one under 71 to emerge the gross overall winner of the Captain’s Day Golf Tournament played on the par-72 greens of the Chandigarh Golf Club here yesterday. The Ball Badminton Sports Promotion Association has organised a coaching camp at Kundan International School, Sector 46, here.